Dr. Dilan Ellegala arrives in Tanzania, shocked to find the entire country has just three brain surgeons for its population of forty-two million. Haydom Lutheran Hospital lacks even the most basic surgical tools, not even a saw to open a patient’s skull. Here, people with head injuries or brain tumors heal on their own or die. When confronted with a villager suffering from a severe head trauma, Dilan buys a tree saw from a farmer, sterilizes it, and then uses it to save the man’s life. Yet Dilan realizes that there are far too many neurosurgery patients for one person to save, and of course he will soon be leaving Tanzania. He needs to teach someone his skills. He identifies a potential student in Emmanuel Mayegga, a stubborn assistant medical officer who grew up in a mud hut. Though Mayegga has no medical degree, Dilan sees that Mayegga has the dexterity, intelligence, and determination to do brain surgery. Over six months, he teaches Mayegga how to remove tumors and treat hydrocephalus. And then, perhaps more important, Dilan teaches Mayegga how to pass on his newfound skills. Mayegga teaches a second Tanzanian, who teaches a third. It’s a case of teach-a-man-to-fish meets brain surgery. As he guides these Tanzanians to do things they never thought possible, Dilan challenges the Western medical establishment to do more than send vacationing doctors on short-term medical missions. He discovers solutions that could transform health care for two billion people across the world. 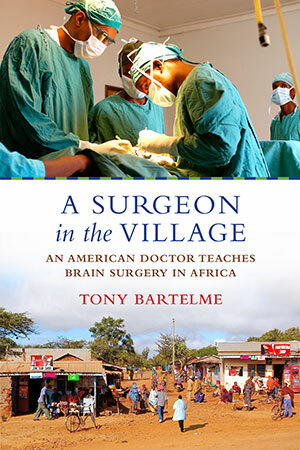 A Surgeon in the Village is the incredible and riveting account of one man’s push to “train-forward”—to change our approach to aid and medical training before more lives are needlessly lost. His story is a testament to the transformational power of teaching and the ever-present potential for change. As many as seventeen million people die every year because of a shortage of surgeons, more than die from AIDS, malaria, and tuberculosis combined. Dilan Ellegala and other visionaries are boldly proposing ways of saving lives. An extensive chapter-by-chapter breakdown of notes, references, citations, documents, and photos can be found here.